Until recently consumers would generally stick to one type of coffee, so coffee machines reflected this by offering a narrow choice of options. But during our ‘consumer safari’ in homes and coffee houses we found that people now want more variety, delivered by a machine that would also require less maintenance, and be stylish and compact. See the backgrounder for more details. So our innovation team went back to the drawing board to develop and design a completely new Italian coffee machine. The aim was to create a machine capable of extracting coffee at two different pressures, so it could produce up to 16 coffee styles: from a high pressure espresso strength to a lower pressure, lighter, more drip-filter like coffee. To do this, a totally new hydraulic circuit had to be developed. To make it easy to clean, we designed a handle on the front of the brewing group that allows users to remove it with just one finger. And we improved the GranBaristo’s automatic cleaning technology by using shorter pipes from the boiler to the brewing group, reducing the water used for the rinsing cycle. 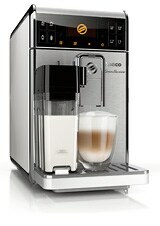 Finally, to keep it compact, we designed the GranBaristo to be used entirely from the front. That means it can be slotted in between other things on the counter top to save precious kitchen space.